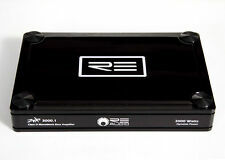 RE Audio 5000W ZTX5000.1 v2 Car Stereo Amplifier (Mono/Class D). RE AUDIO : ZTX 5000.1 v2(Mono/Class-D) - Class D, Monoblock, Bass Amplifier. "Back-lit" RE logo badge. SKU #: ZTX 5000.1 v2. Input Sensitivity: 0.1 ~ 6 V.
That’s where we have taken our new ZTX v2 amplifier line. And the rest – The sound and power classes that match perfectly with all our speaker systems and subwoofers. RE AUDIO : ZTX 5000.1 v2(Mono/Class-D) - Class D, Monoblock, Bass Amplifier. RE Audio 3000W ZTX3000.1 v2 Car Stereo Amplifier (Mono/Class D). RE AUDIO : ZTX 3000.1 v2(Mono/Class-D) - Class D, Monoblock, Bass Amplifier. "Back-lit" RE logo badge. SKU #: ZTX 3000.1 v2. Input Sensitivity: 0.1 ~ 6 V.
SA 1500.1 - RE Audio Monoblock 1800W Peak SA Series Class D Amplifier. SA Series Monoblock Class D Car Amplifier. CEA-2006 compliant amplifier. 3-way protection circuitry (thermal, overload, and speaker short protection). •CEA-2006 compliant amplifier. •Input Sensitivity : 0.25 V ~ 6 V. •Max Power : 500 W. •RMS Power (1Ω) : 500 W x 1. •Variable high-pass filter : 80 Hz, 12 dB/oct. •Variable low-pass filter : 80 Hz, 12 dB/oct. RE Audio SA500.1. 500W Monoblock SA Series Class D Amplifier. 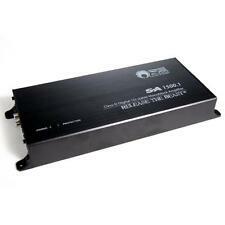 SA Series Monoblock Class D Car Amplifier. CEA-2006 compliant amplifier. 3-way protection circuitry (thermal, overload, and speaker short protection). 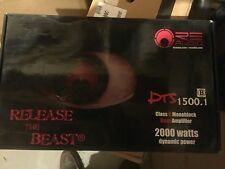 RE Audio DTS1500.1 Monoblock Class-D DTS Series High Speed Power Bass Car Amplifier 2000 W (DTS-1500.1) RE AUDIO DTS 1500.1 2000 Watt Amplifier. 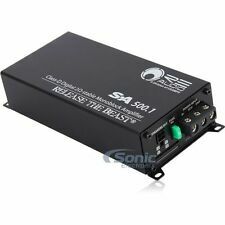 DTS Series Monoblock Class D Car Amplifier. 2-Way System Protection circuitry (thermal and short circuit). MT EVEREST 10K - RE Audio Monoblock 7500W RMS Digital Class D Linkable Amplifier. Digital Class D Linkable Monoblock Amplifier. Stable Into 1-Ohm and 2-Ohm Parallel Amplifier Connection. Bass Bosst at 45Hz: 0-18dB.